Sophia sits with 21 Savage and Teyana Taylor at an Alexander Wang runway show. Photo via Instagram. Picture a model walking down a runway, wearing incredibly textured Balenciaga clothes—with patterns that are new but comfortably fit within the brand’s identity. Only, the model is computerised. Her pose has been chosen by an AI. So are her clothes, not actual Balenciaga as it turns out, but AI-generated renditions of what could easily be their Fall/Winter 19 collection. Robert Barrat, the young self-taught creative behind the AI faux-Balenciaga fashion designer, trained a Generative Adversarial Network (GAN) to recognise and create designs that would suit the brand. GANs such as Barrat’s have a generative component that can take a random noise and upscale it to an image that falls within the brand’s identity, whilst at the same time creating a new data pool for the system’s second component: the discriminator. The discriminator will then try to learn how to distinguish fake images generated by the network from the real brand ones. Both generator and discriminator grow, the first trying to fool the second, the second trying to catch the first. Whilst Barrat is not the only one using AI in the fashion industry, his enthusiasm for the prospects of AIs and humans collaborating on a collection is contagious—and that reality is almost here. Tommy Hilfiger, in partnership with IBM, uses an AI tool to read real-time fashion trends and customer sentiment around every brand product and runway image to then allow its designers to make informed decisions around next season. Alibaba and Guess piloted a system using smart mirrors that not only analyses clothes, all of which are Bluetooth tagged, whilst a customer tries them on, but also alerts staff to bring and suggest certain complementary items. Stitch Fix acts as a personal stylist and shopper by looking at a user’s purchase history and social media activity (their likes on Instagram). Robots such as Stackit can cut, sew, seam, and stack materials to assemble footwear and shirts. A team of researchers at the University of Tsukuba trained their GAN to generate new images that human fashion designers would use to draw patterns from. The patterns were then turned into a program used to make clothes. These were created and tested on users, whose response was positive, with subjects judging the garments to be most similar to those of the actual brand. Considering the above, it isn’t hard to imagine the following scenario. Balenciaga decides to create a new collection, using an AI to assess customer data and predict trends. Barrat’s GAN then generates mood boards and hypothetical models. These are fed into a Deep Convolutional GAN (DCGAN) to create patterns and silhouettes that can be feasibly made and worn. The clothes are produced by a SewBot, embedded with tags that create a constant feedback loop so that Balenciaga can monitor the success of its collection. Sophia is the casting director. Visuals for the runway show are created by E-David, an AI with an arm, five brushes, and a camera that autonomously takes pictures and draws original paintings from these photographs. Young Paint is asked produce and perform new tracks. AI-generated faux-Balenciaga produced by a GAN trained by Robert Barrat. Photo via Twitter. If this were a team of mere humans, relations between fashion houses, designers, tailors, casting directors, art directors, and music producers would be governed by a series of contracts. These would include licence agreements to use, for example, Young Paint’s track in campaign ads or to licence a particular pattern to Adidas for the creation of a capsule collaboration, distribution agreements to sell the collection, and employment contracts between the different parties. These are all grounded, commercially, in the subsistence of copyright in the designs, the patterns, the music, and the visuals. As discussed previously, the lack of copyright protection afforded to genuinely creative AIs leaves us in a lawless landscape in which original works cannot be declared as such because generated purely by non-humans. As neural networks become more advanced and an entire team of AI creatives could be hired, it is imperative to implement models that can accommodate for them. Europe, generally, has been reticent to acknowledge that original works can be created by anyone other than a person—or persons. The romantic notion of authorship is entrenched in the Berne Convention. The instrument, adopted first in 1886 and now counting 176 contracting parties, deals with the protection of works and rights of their authors, by setting minimum protections to be granted and contains special provisions available to developing countries that want to adopt them. Imbuing the Convention with notions equating authorship with personhood has ramifications far beyond the realm of copyright. In particular, as AI systems are ultimately software algorithms regulated under existing copyright regimes, their accountability and (lack of) robotic personhood will necessarily stem from these. Before copyright protection for authors was introduced, sixteenth-century booksellers would hold exclusive rights, known as privileges, granted by sovereigns. Following abuse of monopoly power, sovereigns refused to renew these and a new system prioritising the rights of authors filled the vacuum that was left. Philosophers argued that authors’ rights were found in natural law, and that statutes would exist in order to give them a more precise formulation, justifying the shift. Great Britain, however, with the Statute of Anne in 1710, allowed authors to sell their rights to booksellers, creating a market approach, which was emulated in the US. This meant that authors could choose to relinquish their rights in works too. On the other hand, in continental Europe, an author’s personal and moral rights (such as the right to object to unauthorised modifications of the work) remained inalienable, even if they sold economic rights to publishers. These differences played out during Berne revisions, with natural rights prevailing—perhaps unsurprisingly as these are not limited by national borders: they attach to living individuals and thus suit the spirit of an international standard. Suffice it to say that the group that laid the groundwork for the Convention was the first International Congress of Authors and Artists. In line with a more humanist reading of copyright law, EU and continental jurisprudence have failed to recognise purely computer-generated works, whilst England and Wales, by virtue of s 9(3) CDPA has sought to grant them protection. Yet, despite historically being more commercially focused, common law jurisdictions now lack the necessary models to award authorship to AIs for original works. As noted by Dr Lambert commercial endeavours should be protected, however in the instance of increasing … robotic and AI created works, it remains to be seen whether and how copyright might apply to assist in doing so … without further regulatory amendments. Should future models grant AI-created works originality from a deontological or utilitarian perspective? That is, should an AI’s creativity be rewarded because fairness requires that its efforts be acknowledged or, from a utilitarian perspective, because innovation and its sharing is inherently valuable, there should be no ground for denying copyright or patents to an AI? Before delving into notions of robotic personhood, a simple model envisaged by intellectual property specialist Andres Guadamuz merits consideration. He suggests extending the applicability of s 9(3) CDPA since awarding copyright to the person that made the operation of AI possible is the most sensible approach to encourage investment. However, the proposal again endeavours to find a human behind the machine, and cannot work with current systems as none of the human players meet the threshold of authorship. Programmers, trainers, data providers, feedback providers, owners of an AI’s hardware and/or software, AI operators, users, buyers… these could all arguably be classified as “those that made the operation of the AI possible” and having a myriad of stakeholders would create unpractical scenarios with rights awarded at such fractional levels that it would be tantamount to having no rights at all. Zach Blas and Jemima Wyman, i’m here to learn so :)))))), 2017. Showing Tay, Microsoft’s AI that was launched on Twitter in 2016, hacked shortly after, and then removed over a Deep Dream generated backdrop. Photo by author. Reducing the number of stakeholders is at the heart of another model developed by the Japanese AI task force currently working on protecting AI created works from unauthorised use and to ensure fair compensation of the developers. Shinzo Abe himself cited support to universities and companies in the field of creative innovation as its main driving force. Yet developers and programmers are already being rewarded for their efforts: they hold copyright in the software system behind the AI. Why should they be rewarded for an AI’s artistic creation? This is equivalent to Microsoft being entitled to rights over any written work a user produces despite already owning software rights in Word. Scholars such as Ana Ralmho have sought to avoid double-incentives to developers by suggesting that legislators should adopt a public domain model for AI creations, enabling the public to use and reproduce these without restrictions. Whilst this would resolve the issue of multiple stakeholders, it would prove problematic, as Balenciaga would shy away from using any AI in its collection if the same patterns, music, and visuals created for its runway become part of the public domain at the point of creation. Once in the public domain, anyone could use their same exact designs with no copyright restrictions—as if they were free stock images—to create their own collection. Balenciaga bootlegs would no longer be bootlegs. A revised version of the above public domain model is considered by IP and technology scholar Pratap Devarapalli. He refines the same by providing authorship to the AI and ownership rights to the person(s) behind the machine, under a Non-Commercial Creative Commons (NCCC) licence. The NCCC would enable licensees to copy, distribute, display, or make derivative works only for non-commercial purposes. Protection would be awarded for 50 years from the work’s availability, with no link to an author’s life as is currently the case, arguing that under this regime AI creations would have an identity and boost innovation whilst still incentivising creative teams. Once again, the workability of the model is highly dependent on the amount of humans involved behind the AI becoming autonomously creative. Viewing authorship as a purely human phenomenon is antiquated and fails to protect the fruits of an AI’s creativity or acknowledge current technological advances. Granting a Balenciaga GAN-fashion designer, E-David, or Young Paint robotic personhood would allow them to be rightly recognised as authors of their original creations. At first, it may seem that AI authorship could not possibly find justification in principles of natural law. However, arguably an incentive-based model is more unsuitable. IP laws under common law intend to benefit owners, who can use royalties as a means to enhance their works and life, but machines have no similar needs (as of yet). Perhaps the most apt model to date is one that aims to expand an exception to general copyright rules without overhauling these. 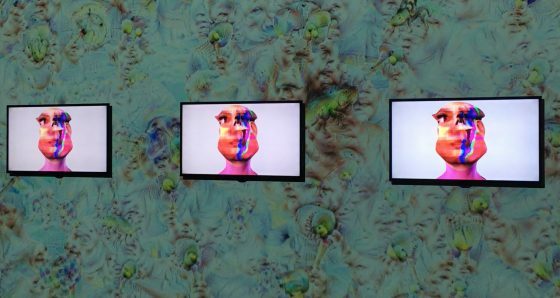 Put forth by law professor Shlomit Yanisky-Ravid, the Work Made For Hire (WMFH) model imagines Young Paint and its fellow AI creatives as employees or independent contractors. Each AI is considered to be the author of the creative work produced, but ownership passes automatically to its employer or commissioner, which, in our scenario, would be Balenciaga. This is precisely how fashion brands operate today: designers are hired by the brand to create collections, and whilst acknowledged as authors, ownership in the designs passes to the brand itself. The model doesn’t shy away from understanding an AI-creative’s human-like features, whilst at the same time providing commercial force. By awarding both benefits (i.e. ownership in the works) and responsibilities to the user employing the AI, it hopes to resolve issues associated with the vast number of stakeholders that need to otherwise be considered as ‘humans behind the machine’. The model is flexible too: a user could be Balenciaga in one instance and Saint Laurent the next. Of course, the model rests on one fundamental principle: that an AI’s works can be copyrightable, meaning current IP laws still need to move away from historic notions of personhood, as illustrated. In granting full robotic personhood to Young Paint, E-David, and Balenciaga-GAN, a new range of complex legal issues would have to be determined: their employment rights, citizenship, ability to travel, be compensated and crucially, their liabilities. Whilst AI authorship and personhood have largely been shunned as philosophical inquiries because they call into question what it means to be human if we allow non-human entities to share our same intellectual rights, the question of liability and infringement has actively been debated by EU regulators and legislators. Feeding AIs large quantities of data and being unable to control how the neural network processes these is very much a contemporary challenge, and analysing associated enforceability issues is as pressing as recognising and rewarding an AI’s creative efforts. Barrat shows works produced with his code against those produced by Obvious Art. Photo via Twitter. 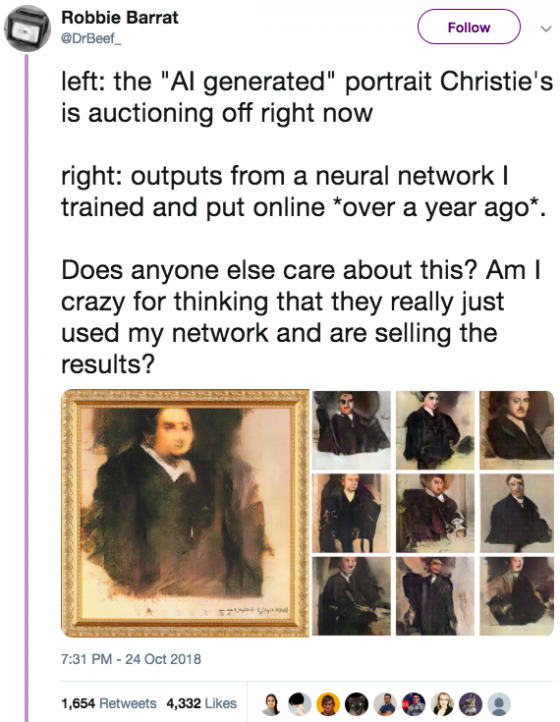 To illustrate just how complex these liability issues are, one can turn to Christie’s recent auction of Portrait of Edmond Bellamy, a work of art generated by a GAN purportedly developed by Obvious Art. Besides the astounding price paid, the sale revealed intricate issues surrounding the AI art community. The code used by Obvious Art was in fact predominantly that developed by Barrat, who had released it on GitHub using an open-source licence. Whilst Obvious Art’s members recognised that they hadn’t modified Barrat’s code significantly, they argued that the amount of time spent on applying it and training their AI amounted to rewardable creative effort. AI artist and academic Tom White took an opposing view, noting that downloading Barrat’s code, unedited, yielded extremely similar results to those produced by Obvious Art’s AI. Yet, no matter how eerily close the images generated may appear, Barrat would have little to no avenues for redress. For one, academics have argued that GANs share a similar aesthetic—referred to as GANism—due to the way in which they process data, characterised by indistinct and melting boundaries. Second, to distil the exact impact of Barrat’s code on Portrait one would need to consider all steps involved in presenting the final work: collecting data, constructing the generative algorithm, training it, and selecting its best possible outputs. Third, Barrat’s code is available on an open-source licence meaning that users can review and modify it, whether or not for commercial purposes. Although the above matter involves relatively few parties, significant difficulties already arise in proving liability for copyright infringement in works produced by two GANs when this may appear clear-cut to the relevant community. Problems would only increase exponentially if the dispute were between two creative AIs seeking to enforce their rights. Without data processing regulations in place, and assuming both had full access to the internet, what would happen if they designed extremely similar collections for two different brands? Distributing liabilities amongst each of the possible players in the growth of the respective AIs would prove futile, yet this is precisely why legislators and regulators need to consider hypothetical scenarios of this kind. Imagine the same Balenciaga show. As models walk down the runway, Young Paint, now working under a different record label than Actress’s Werk, starts playing a song that is too similar to Actress’s own Falling Rizlas. E-David’s visuals start to grow closer to David Hockney’s Splash. The patterns themselves now seem to recall Comme des Garçons’ collection, shown only an hour ago. Actress, Hockney, and Rei Kawakubo are all in the crowd. What happens next?